Designed to make photoshoots a breeze, our test kitchen isn't all for show—and these are the features that make it run like a well-oiled machine. 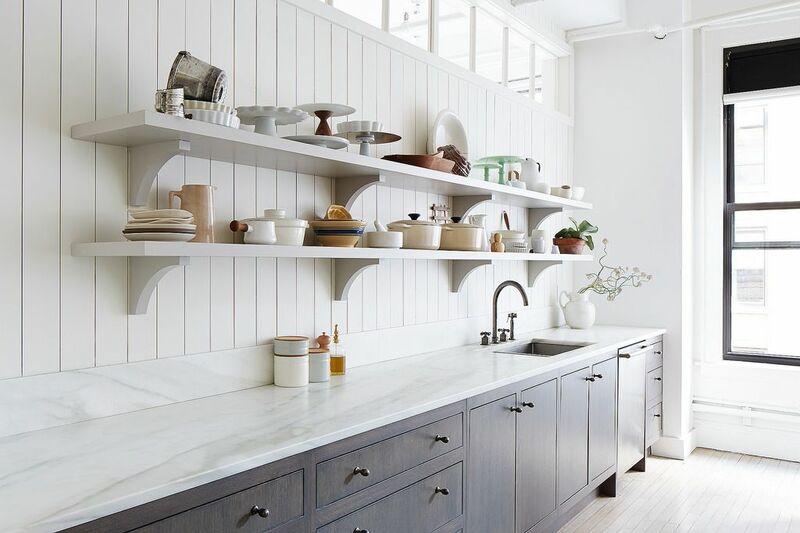 For all the kitchen junkies out there (or anyone planning a remodel), our test kitchen is worth taking a closer look at—and not just because Brad Sherman made it look so pretty. Since it was designed to accomodate photo shoots and be the first thing you see when you enter our office, this kitchen isn't exactly as it would be in a home: The hood above the range is extra tall, so you can photograph a person cooking without it being in the way, and all the pantry storage is on the other side of the wall, well out of sight (more on our organizing strategies there, coming soon). But there's a lot going in the design that we are dying to steal for our own home kitchens. Derek Laughren, our Test Kitchen Manager who spends more time in the space than anyone, was kind enough to share exactly what he loves and appreciates about our kitchen the most. And since we furnished it with help from Waterworks Kitchen, their CEO and Creative Director, Peter Sallick, also weighed in on the creative process and designs. "I really like this rack," Derek tells me, gesturing to the open shelf underneath our industrial-style Cuisinier worktable from Waterworks, when I ask what he loves about this corner of the office the most. "Not only because it’s extra storage—it shows off our pots and pans in an appealing way. It’s also nice because they’re more likely to dry fast, which prevents dust from collecting." The slatted shelf is part of the cast steel frame of the table, which is incredibly heavy-duty but not at all clunky, and topped with a thick slab of Carrera marble. Besides being so solid, it's beautifully designed. "I love to explore the connections between industry and art," says Peter Sallick, the Waterworks CEO and Creative Director, an intent that is visible in all of their designs. Nestled up against a wall of windows, our test kitchen gets a steady flow of sunlight from one side and features workspace on both sides of a single aisle. "I wouldn’t rearrange it if I could," Derek says (and I hope our designer, Brad, hears him). "While natural lighting is most important for the [photo] set, it's good to see how a dish will look in a photograph while you're cooking it." There are also mounted and hanging lighting fixtures to keep counterspace free. "I really love this lamp," Derek says of a mounted vintage design that extends up and down, illuminating a nook beside fridge without adding clutter to the counter. "It's great because you can change the height as needed." "Having two sink compartments is nice even if one is small, because you can wash dishes and just use one side that’s totally clean to rinse them." Derek gestures to the faucet, a four-hole design from the Henry line by Waterworks. "And there's enough height here that you can put bulky things in the sink." The spray nozzle, he adds, is indispensible. In developing the Waterworks Kitchen line, Peter says that a lot of research went into how people actually use their kitchens. "The sink is the most common bottleneck," he tells me. "We see sinks as the new large scale kitchen appliance, since they are one of the most used items in the kitchen," which explains why ours, a double stainless steel model from their Kerr line, is so roomy. The marble-topped work table is not just essential because it's got Derek's favorite shelf: "It's great for working with doughs and pastries, since marble is so easy to scrape clean," Derek says, "and having both wood and marble is huge." The work table is pushed right up against a butcher-block wooden counter, which is used "for almost all savory stuff. It's great for kneading bread, and is naturally antibacterial so you don’t have to worry. It does require a little more upkeep, but it’s worth it." 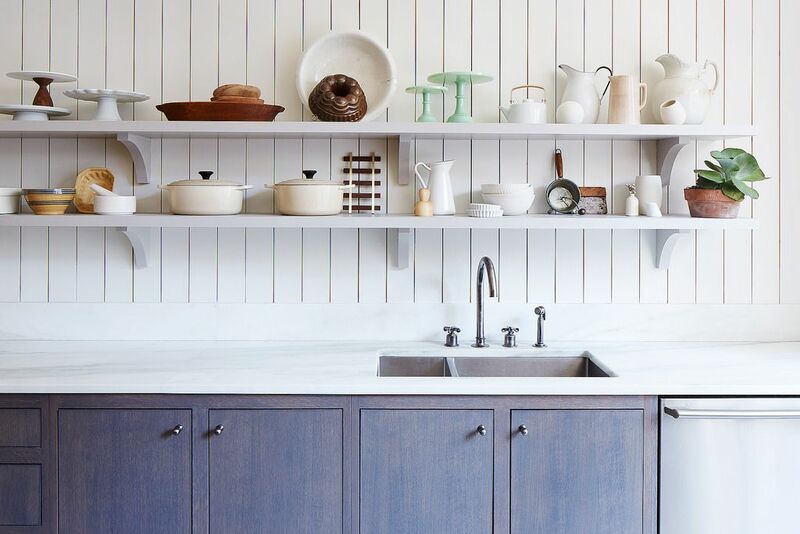 Ample counterspace is a noticeable characteristic of the kitchen, which is important because on shoot days, any number of editors and stylists are wandering in and out of Derek's domain. Derek and I are both fond of the dark grey finish on our Waterworks Alta cabinetry, and also the gunmetal pulls, which pop pleasingly against the blue and peach tones in the wood. They're modern and minimal, but not at all austere. 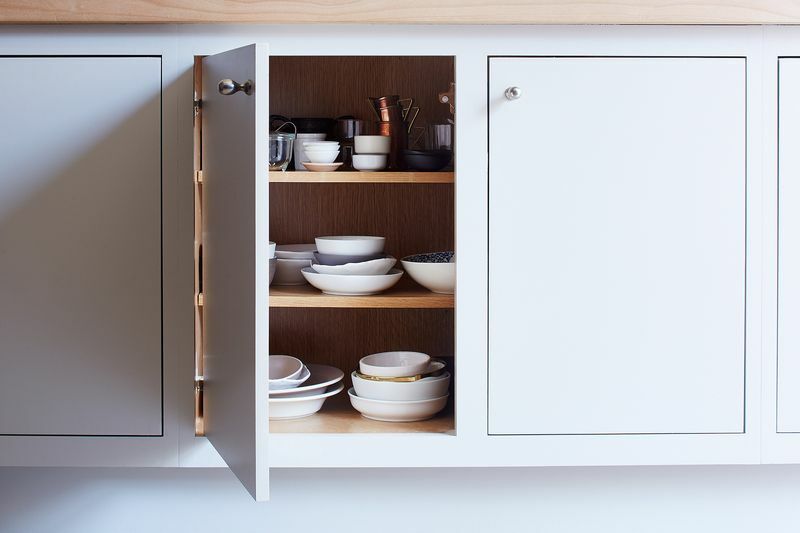 Peter sums up the design: "It’s a pared down cabinet that has an influence of mid-century design, celebrating natural material and prominent hardware." "And the shelves inside are adjustable, so you can fit even bulky cookware," Derek points out. "I love this drawer right under the oven, which is great for storing pans." We also agree that the cushioned close, which prevents you from slamming a cabinet or a drawer, is especially awesome because you don't notice it. I honestly thought this was a kitchen from Neptune, the British furniture company. 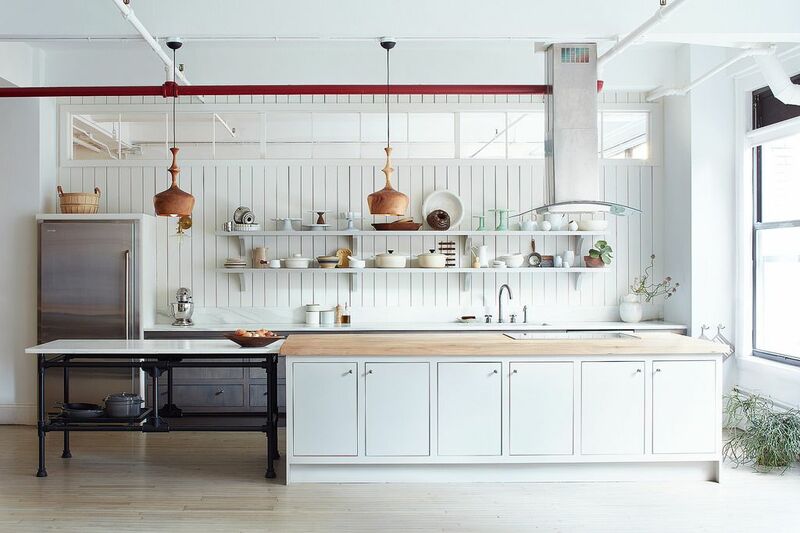 Can someone give me the source for the copper hanging pendants over the island? Thank you! I agree about needing a big sink. Split sink doesn't work for me. I need something big enough to wash my big baking sheets without spraying water all over the kitchen. Also, love open shelving. I added some in a renovation and it forces one to de-clutter and to keep only the things you use on a regular basis. Now, I don't buy new kitchen items unless I know where it's going to live. Big, Roomy Sink? Must be in another area.... That sink won't hold a decent big stock or soup pot. Sink looks like it is one with straight square edges, if this is the case, all I can is good luck keeping it clean! Classical example of design hubris - looks good, but functions terribly. I speak from experience. Designers need to actually work in and clean kictchens to get it right. I did check out Kerr's website and they do have some great practical and beautiful models. I hope for Food52's cooking team's sake, you have one of these! I'm really intrigued by that expanse of white marble. Do you have to shoo wine-drinking guests away when having a party? And keep all citrus away? I would never get two taps with that faucet . . . . the single control with a pull-out high pressure spray nozzle (Grohe, so worth the extra cost), which can easily be used with a single hand, is ever so convenient. Finally, I'd be interested in seeing how that light wood floor holds up after a year or so of everyday use. I saw an Instagram shot of it near the cabinets, and it appears already not to be wearing very well. And finally, for the record, I stand squarely in the open shelving, no thanks, camp, for quite a few reasons, that are both practical and aesthetic. you don't have pull out shelves beneath the countertops ....that makes life so much easier...otherwise it is [email protected]!! Yes, loubaby, that was one of the first things I noticed. Those were one of the best improvements we made when we re-did our kitchen. So worth the relatively small investment. What is the actual color of the blue cabinets - love! Function...oh yeah! Good looks ...definitely! Easy clean...you have to ask?